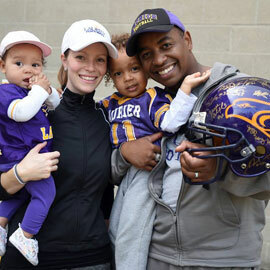 Laurier’s Waterloo campus Homecoming takes place Sept. 29-Oct. 1. Homecoming is our chance to welcome our Laurier alumni home – and it’s their chance to reconnect with their former classmates, stay involved with the university, and to ignite their Golden Hawk pride. We are proud of our Laurier students and of the Golden Hawk community that we all represent – and at Homecoming, our alumni, students, guests and our community neighbours all become part of our Golden Hawk Family. With this in mind, we encourage students to show respect and stay golden at Homecoming: show respect for each other, enforcement officers, our neighbours and our alumni. Remember what it means to be a Laurier Golden Hawk, our reputation, and how you want to represent yourself to our returning alumni. The university does not plan, encourage or condone off-campus Homecoming activities; despite this, some students choose to participate. Students are expected to engage in safe, responsible and respectful conduct and will be held accountable for their actions. If you are of legal age to drink and choose to consume alcohol, drink responsibly, know your limits and never drink and drive. It is necessary to obtain consent for all sexual encounters. Alcohol impairs people’s ability to give and receive consent. If you or a friend needs help, always ask for it: download the SAFEHawk app and contact Special Constables at x3333. Always carry identification with you in case you need assistance and identification is required. Arrange a safe way home: use Foot Patrol (519.886.FOOT / 519.886.3668), call a taxi or use the Friend Walk feature in the SAFEHawk app. Please respect our neighbours’ homes and properties when travelling to and from events. We are all part of the same community! For those attending Saturday’s football game, please be careful when walking on city streets to and from the game. During the game, look out for your friends and respect your fellow fans. To ensure the safety and comfort of students in residence, guests are not permitted in Laurier residences during Homecoming weekend. This guest restriction will be enforced through a wristband policy. Waterloo Regional Police Service supports safe behaviours and the safety of our students and neighbourhood community. Police officers and Laurier’s Special Constables will be at the Homecoming football game and will be patrolling the neighbourhood. Consuming alcohol in public areas is prohibited. Violations may result in a ticket. Selling alcohol at keg parties is illegal. Police continue to monitor the illegal sale of alcohol. Charging money for people to consume alcohol, even when promoted as a ‘cleanup fee’ or a ‘fee for the bracelet,' is still considered selling alcohol by police and the courts. If purchasing alcohol, do so from a licensed establishment, be of legal drinking age, drink responsibly, and arrange a safe way home. Throwing objects from high-rise balconies is prohibited, and police will be monitoring. Interior hallways and all exits must remain free and clear of obstructions at all times. In the event of a fire, follow emergency procedures and have two exits out of the building. Falsely setting off a fire alarm, fire extinguisher or smoke alarm is a criminal Code of Canada offence. The fine for setting false alarms is $179.11 per hour, per firefighter. Compliance officers will focus on noise issues, public urination, garbage and property standards. All tenants on a property lease are equally responsible for all activities at their residence. Make excessive noise (fine $490).